Sept 13 – Why to consider refurbishing. 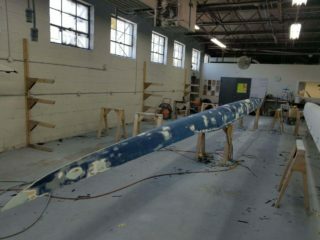 If you know any of the guys at Finish Line Rowing, you hear us talk a lot about refurbishing boats. It has come to our attention that many people want to know what ‘refurbishing’ means to Finish Line and want to know why we always recommend it. We recommend refurbishing because the boats manufactured today are exceptional. There is no question. Each hull made today will last far longer than they have in the past. They do require some maintenance and care. This is where we start to get excited about discussing refurbishing. 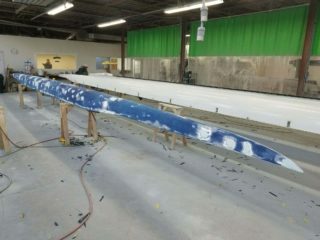 Lets start with what Finish Line Rowing considers “Refurbishing” a boat. Excess damage [broken/leaking finbox, larger punctures, etc.] is evaluated and you will be provided estimate for approval. Excess damage [broken/leaking finbox, larger punctures, etc.] isevaluated and you will be provided estimate for approval. Cost and Savings – You can refurbish it more affordably than you can replace with a nicer hull. Reliability -Boats are better built now, you know what you have and how it has been cared for. 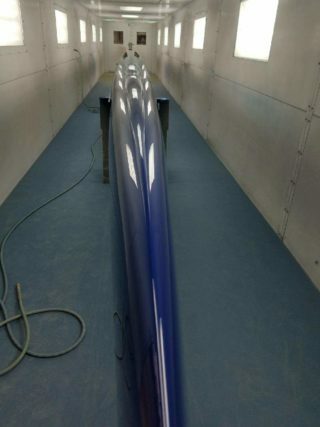 Pride – Athletes take better care of boats that are maintained. Cost and Savings – We aren’t telling people to stop buying new boats. We are only encouraging people to consider refurbishing your boats every 6-8 years. While boats are build better than ever, there are still pieces that wear out, get dinged and need upgrading. Wheels and tracks wear out, and can you imaging wearing shoes that regularly get wet and are stored outside? Imagine you have an 8+ in your fleet that is ~8 years old, and everyone talks about it being ‘beat up’ and ‘in need of replacement’. You are going to be looking at having to spend ~$20,000-$25,000 to replace that 8+ with another similar aged 8+, that might be in marginally better condition. Or you can invest in refurbishing a boat you are already familiar with, a boat you know the history, a boat your athletes have already rowed. You upgrade all the internal moving parts, the wheels, tracks and shoes. You strip and repaint the hull [maybe a fancy new color scheme, or back to its original shine]. 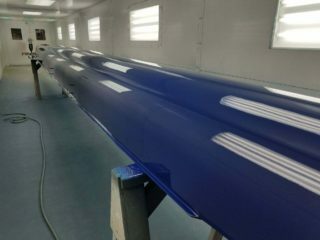 Now, you have a boat that looks like new, for a fraction of the price. Reliability – Boats are better built now, and you know what you have and how it has been cared for. One of the best parts of refurbishing is that you know the history of the boat. You know how it rides in the water, you know the size crew you can put into it, and you know what the rigging should look like. Hopefully, it has not sustained any major damage, and has been a reliable boat in your fleet. Giving it a facelift will only extend that reliability. Pride – We don’t have any scientific findings or math to base this claim, just what we have observed. But we think this is pretty straight forward. We routinely see athletes take better care of boats that look nice. An added bonus – if you have a fleet that is a mix of colors or manufacturers, this lets you get the color scheme all in line. We recently give an entire fleet a make over and united the brand of the program across multiple boats, that were a variety of ages and manufacturers. Take a close look at the pictures in this article. 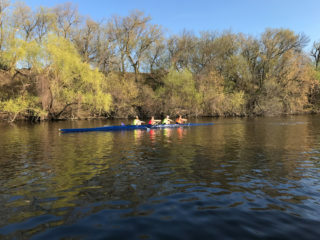 The boat in this picture was a different color of blue with a yellow stripe [non-Milwaukee Rowing Club colors]. It was covered with ding, delams, and crush spots. 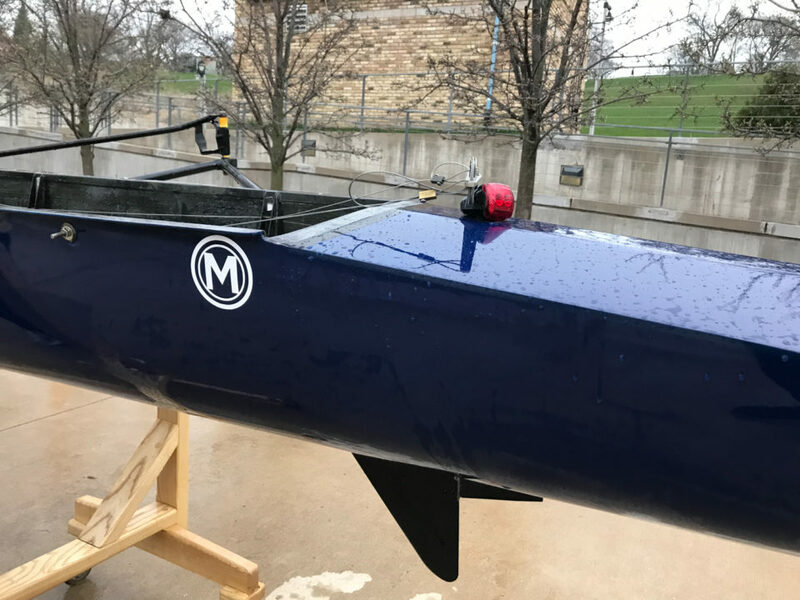 After a couple weeks of work, it went back to Milwaukee Rowing Club looking like a new boat!